Get rid of the darkness with YLighting. 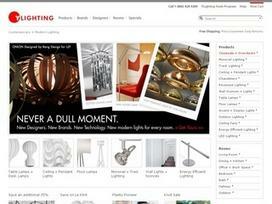 From its inception in 2001 through today, YLighting is the ultimate destination of modern contemporary lighting. Often regarded as functional art modern lighting, it involves a lot of effort to bring you exciting new designs. The online store showcases an exhaustive collection of modern and contemporary lighting fixtures and chandeliers to complement your home decor and commercial applications. The store will surely dazzle you with its exclusive European-designed fixtures from Vibia, mesmerizing Artemide, and Flos collections from Italy, ceiling fans from the Modern Fan Company, George Nelson Bubble Lamps, and exciting lamps from Italian firms Oluce and Prandina. Dedicated to customer service, the store provides a group of friendly and knowledgeable lighting veterans to solve all your queries and to take care of your convenience. YLighting clients include many of the big hotels like W Hotels, The Breakers and Neiman Marcus. The user-friendly website presents comprehensive information while you shop online. The safe and secure website welcomes you with a long catalog to choose from: lighting resources for consumers and lighting resources for professionals, along with the product details. For your shopping convenience, you will find product categories like Lighting, Brands, Designers, Rooms, Modern, Classics, and New Modern Icons. Use the onsite search engine for a quick search. Many of the big names available range from Modern Fan, Artemide, Fontana Arte, Flos and Louis Poulsen. You can shop by designers, rooms and lighting. Buy recessed lighting, table lamps, floor lamps, accent display lamps, outdoor lighting, LED lighting, energy efficient lighting and close-out specials. In the Shop by Room category, purchase lights to complement the mood and theme of your drawing room, your dining room/kitchen, your office or work space, and for your bedroom. At YLighting you get the rare opportunity to buy the products of renowned designers like Al Glass, Achille Castiglioni and Afra Scara to name a few. You can also watch for Lutron, Traformers, light bulbs, Levitton dimmers and ceiling fans. Sparkle your world with lights. A visit to the interesting Extra section of YLighting will tell you all about lighting, especially about modern and contemporary lighting. The store offers free shipping over a certain amount and an easy return policy for customers' convenience. So hurry; visit the store today! Share what you think about YLighting, and your favorite ways to save there!